on building trampolines with more than 50 years of experience. On the one hand we produce high quality products for professional competitions, leisure time and outdoor products, but on the other hand it’s our mission to boost the interest in our sport and make it as secure and comfortable as possible. We believe building innovative products with maximum quality is not enough. We also need to increase the quality of the education process. This is why we originated the Trampoline Education Program. 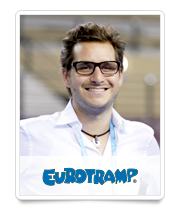 "It is a great pleasure for me to present the Trampoline Education Programme by Eurotramp on DVD, Blu-Ray and online. An innumerable amount of hours has been spent preparing, filming, reworking and organising, from the beginning of 2007 when we were first inspired to develop such a programme, until June 2011 when the programme was finalised. More than 80 people have taken part in developing this programme, the results, I am sure you will agree, are very impressive: 5 hours of educational material on video which offers unequalled opportunities within the trampoline branch as far as quality and content are concerned. The second part includes exercises for the more advanced students. The whole project has been produced and financed by Eurotramp with the intention of boosting interest in sport in general, by providing a programme which improves the quality of education and sets new standards as far as safety is concerned, we hope to achieve this goal. We would like to thank the International Gymnastics Federation (FIG), the European Gymnastics Union (UEG) and the German Gymnastics Federation (DTB), furthermore the German Academy for Psychomotricity who have supported this programme from the beginning. The support they have given is essential to increase the worldwide acceptance and distribution of the programme. Thanks to all those who have helped to make this programme possible!" It's all about fairness and quality! "Made in Germany" signifies first class handcrafting, highest aspiration and fair working conditions. Every single Eurotramp product is crafted in Trampoline City, our manufactory in Baden Wuerttemberg (Germany).